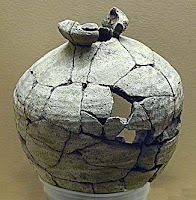 Abiding In His Presence: Broken Cisterns and Pots!! The people of Judah were in chaos. They had turned away from God and had turned to their own efforts, understandings and devises to meet their own needs. The reference to them digging their own cisterns, broken cisterns...that couldn't hold water was to the fact that all that they did, away from God, was fruitless and wouldn't last. The pure and living water they needed was not going to be found in and around themselves or their own efforts. Wow...my friend, that's been me!! All my efforts to find the perfect diet, the perfect pill or the perfect exercise was just me trying to fill my own broken pot with poisoned water. I'm an extremist and I went into each diet (again and again) with that mindset. If I just can count every bite or weight each portion or do the perfect meal schedule...then MY EFFORTS would produce weight loss....and they did....for a short time, but after awhile...the weight always came back on! I'm not against diets or exercise...but I'm learning that when it is the only thing I'm doing....it will never last nor satisfy, and my own self glory will be exemplified instead of God's. It amazes me that I would keep trying to fill that broken pot over and over and over again with all sorts of devices, tools and really anything I thought would make me lose weight and make me happy! Each time I would be sucessful...but the results were never, ever lasting. With each success came more and more pride! God will share His glory with NO ONE! So my first sin was turning away from God and looking to my own efforts and the second sin was continually filling my broken cistern over and over again with things that did not eternally satisfy. When those diets didn't last ....I would then turn to other things that could fill my pot...things like overeating again or buying something that would make me feel better. Fill...refill...and fill again, that has been my pattern. Men are in a restless pursuit after satisfaction in earthly things. They will exhaust themselves in the deceitful delights of sin, and, finding them all to be vanity and emptiness, they will become very perplexed and disappointed. But they will continue their fruitless search. Though wearied, they still stagger forward under the influence of spiritual madness, and though there is no result to be reached except that of everlasting disappointment, yet they press forward. They have no forethought for their eternal state; the present hour absorbs them. They turn to another and another of earth's broken cisterns, hoping to find water where not a drop was ever discovered yet. I believe that Mr. Spurgeon has hit it right on the head! Our lives today are spent with us "continually searching" over and over and over again to fill a void, a deep rooted void. We don't feel loved enough, good enough, skinny enough, rich enough, smart enough or you can add in anything that is causing you to fill your broken cistern with impure water. Why do we work so hard at filling our broken cisterns....when we repeatedly find them empty and not working? I believe that it is because we are blinded by the enemy into believing that our God isn't big enough to actually fill our deep rooted void and keep us satisfied. I also believe that the world today gives us so many "things" to try to fill that void quickly and we just can't resist the "quick fix" syndrome. We are fed commercials daily, that if we are in need...well, they have the perfect "thing" to meet that need (and if you call now...they will send you TWO!). Between "quick fixes" and "do it yourself" answers....we are unable to see the real problem and the real answer! 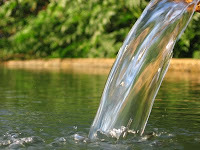 God is my source of "living water". He alone is my true source of refreshment, joy and nourishment. God is ever fresh and new. And when I make my time with Him a priority...I walk away filled and satisfied!! Amazing...I then have the right motive, heart and soul to make good decisions in my eating and everyday life. I now come to the table with joy and thanksgiving....joy over who God is in my life and thanksgiving that He is my real satisfier, my real deliverer! No longer will I be satisfied with filling my cistern with poisonous sewer water....only the refreshing pure Living Water will do for me!! Have you had a good strong drink of God's living water?? AMAZING!!!! Great Blog. It really made me think am I doing this in my life with anything? Probably so! Thanks for making me aware!